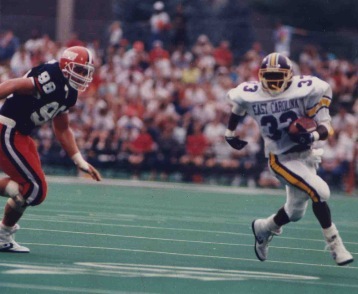 East Carolina's Cedric Van Buren (33) sprints away from a pursuing Illinois player during a 1991 game at Memorial Stadium in Urbana-Champaign. The game, which resulted in ECU's only defeat that season, ended amid controversy over a call by a Big Ten official that aborted the final drive of a furious rally that would have given the Pirates the victory. The Big Ten office subsequently issued an apology for the call. With all of the flashiness displayed by the likes of Jeff Blake, Dion Johnson, Luke Fisher, and Hunter Gallimore in East Carolina's thrilling 1991 Peach Bowl Championship victory, it might have been easy to forget the consistent, workman-like contributions of Cedric Van Buren. In contrast to his more famous colleagues, Van Buren’s football style was understated, quiet, and subtle, yet his game was no less exceptional. Van Buren still is understated as a man. He works hard at what he wants to do in his life and he doesn’t worry about a whole lot of things otherwise. Living in Charleston, SC, with wife NaPrell and son Malcolm, Van Buren works at Nucor Steel and owns a pair of side businesses — a photography studio and a modeling agency. And, as ever, he is still the avid football fan and student of the game. INSTRUCTIONS: Click the 'Play' control (>) to cue up the 6-part play list. Click the 'Next' ( >| ) and 'Back' ( |< ) controls to skip from clip to clip. Meticulous in his preparation, Van Buren’s commitment to playing every down as it should be played from whistle to whistle was on display in that Peach Bowl game. Van Buren scored the Pirates’ first touchdown and then late in the game, came up with one of the biggest fumble recoveries in ECU history when he pounced on a Dion Johnson gaff to preserve a drive and keep the comeback going. Despite having to end his career just a few games into his senior season, Van Buren’s mark was indelibly left on ECU. He could be the prototype player for success at ECU… a talented kid willing to outwork, out-prepare, and outthink the opponent. Van Buren was always that type of football player… from a very young age. Growing up an only child of parents Alba and Melvin in Charleston, SC, Van Buren socialized through sports and quickly realized he had a knack for games. “My dad played football for Vorhees College,” he said. “I learned playing outside. It was my neighborhood. In my neighborhood, if you didn’t play sports, you didn’t do anything. When the sun came up, I was up. Been that way always… my whole family is like that. But as fate would have it, baseball would not last as long as football because Van Buren soured on the national pastime. So it would be football. As he matured, he broadened his horizons in sports, running track in the eighth grade and starring on the junior varsity basketball team at Middleton High School. He was the hoops MVP that year. But football always reigned king for Van Buren. Van Buren’s home life was such that he felt comfortable exploring all his dreams when he was a kid and that made it easier for him to push himself in football. Van Buren's competitiveness came from his friends and his desire to be great on the field came from inside. And though it would be another 12 years before he fulfilled his declaration, Van Buren found success came pretty easy for him on the field en route to his collegiate career. “My first year (on the varsity), there were three of us in the backfield (all sophomores). But, I kind of evolved as the one feature back,” he explained. “ My 11th grade year was when I got the most attention. Even now, I can go around here and people who were around back then will stop me and talk to me for hours about some of the moves I put on some people back them. That injury was probably the reason East Carolina University showed up on Van Buren’s radar screen during his senior year in high school. While it was true that Van Buren had not really put much stock into ECU until the injury shook up his recruitment, the running back found things at his future school that quickly put the Pirates atop his wish list. “I liked the offense and mostly I just enjoyed the people,” he said. “I remember I went up to take my recruiting visit to South Carolina. The first day they took me around and the second day I didn’t even go out. I stayed in the room the rest of the time because I knew I was coming to East Carolina after that. I hadn’t even gone to visit ECU yet, but just talking to Coach Shankweiler at ECU and the people I met (at South Carolina), I knew I wasn’t going to USC. I still don’t like Columbia too much to this day. Though his father was not so keen on the choice right away, he warmed to it and mom was fine with it all along. Mom was happy because her son was ecstatic. On his recruiting visit, he knew for sure. “You know, Al Whiting was my host and he took me around and it just wasn’t the same as other recruiting visits,” Van Buren recalled. “I went to North Carolina State and it wasn’t anything like ECU. The players I met there… it was a whole different atmosphere. Once committed to the Pirates, Van Buren focused on coming in ready. “My expectations were to come in and work hard and not have anyone have to tell me how to do things twice,” he said. “A lot of guys came in with different expectations. Willie Lewis was the starting running back at ECU, so that summer (before his frosh season) I cut out his picture and put it on my night stand for that whole summer. On mornings I felt like not getting up, I looked over at that picture and it gave me the push. I’d get up at 4 a.m. and eat something and then ride my bike down the highway and come back, run 2 1/4 miles, then hit the gym. After that, it was work by 8:30. That’s quite a lot to do before 8:30 in the morning. Though physically ready, Van Buren knew that a whole lot of football education lay ahead for him, particularly considering the teacher-like approach of his position coach. It was true. By the end of his freshmen year in 1989, Van Buren was the starter at tailback. Injuries to Lewis and backup Denell Harper opened the doorway of opportunity for Van Buren and he made the most of it. Though it was a rude introduction into the lineup, Van Buren showed promise. Despite being just a freshman, it wasn’t lost on Van Buren that the team was lacking something. Though he was the returning starter his sophomore season, the offensive scheme required him to be more flexible in the backfield. He found himself sharing the backfield a lot with Dion Johnson but still piled up 788 rushing yards that year, setting the stage for the famed 1991 season. For Van Buren, who constantly would find himself analyzing his own efforts and that of his team, the 1991 season gave great context to the failings of the 1990 season. Still, when he assesses the 1990 season, even in the losses Van Buren found things to be excited about. “Oh boy, I remember that Georgia game (19-15 UGA win) there,” he said. “Boy I remember that. Georgia was one of those games where we were there. We had some of our main guys making plays. The thing that enabled Georgia to win that game was our second line guys — that is where Georgia had us. They had a fullback, Mike Strong, that guy there was doing some hitting out there. You didn’t hear much about him… you heard about Garrison Hearst. Hearst gets out in the open field and he is unmatched. But that fullback was out there destroying people. Good teams pull those type of games out because everyone gets up to play those teams. Good teams get done what they have to. Lessons-learned from 1990 made the difference for the ’91 team and Van Buren zeroed in on the turning point in that glamorous season. “That 1991 season just kind of happened,” he said. “We lost to Illinois to start the season off. We were like, ‘Oh boy, here we go.’ But then, you look at how close that game was and the small things we didn’t do in that game. We came back and started playing. After two games we started to get a swagger. The turning point for us was when we played South Carolina. We were so hyped up that week because they were coming to us. The year before, they beat the snot out of us and it wasn’t because they were better. I think mentally and I think scheme-wise we let up on them a little bit. It was one of those things where South Carolina, when they came in, we had so much planned for them. While the Pirates were rolling, Van Buren saw his touches reduced in the backfield, which was fine with him. “I wasn’t really disappointed in my role in the offense,” he said. “Of course you want to run the ball more, but when we went to the single back set, I was having to learn how to run in that thing. I was an I-back… a tailback in high school. Just like the Denver Broncos, they run a lot of that zone off tackle stuff. The little zone plays where the runner has a choice of three different places he can go. It is hard to take a tailback and teach him that. It took me until the week of the Peach Bowl before I understood that. In ’91, I was just another piece of the puzzle. I was a receiver coming out of the backfield, really. I understood my blitz pickups. That is one thing about me, I could dissect a defense. I don’t care what game plan they put down for the week, I took it back to the room, looked at it and I had it down, quickly. That helped me a lot." For Van Buren, it certainly looked like his game had come together in the Peach Bowl and it didn’t take long for him to make a quick impact. Van Buren was on the receiving end of the first of Jeff Blake’s record four TD passes in that game and it was on a play in which the play action fooled just about everyone in the stadium. “We had a Triple-I back there and I was squatting behind Jeff,” he recounts the play. “And actually Dewayne Washington who is now a defensive back for the Jacksonville Jaguars — was the corner. We used to run some plays that season where we ran isolation on the cornerback and kicked him out (on a block). You could tell State had studied our film well because when I came through he squatted on me like he was ready to take on a block, but then I slipped past him and you could hear him say, ‘Oh no!” when I slipped past him. It was a perfect call because they had studied us on the kickout block. He was so ready to put his shoulder in to take on the block. I just swaggered past him and he tried to get back, but it was too late. While he was aware of the fans at the Peach Bowl, it was not until after the game that he understood the crowd's magnitude. Afterwards, when the State arrogance was silenced through a dealt defeat, Van Buren took note of the crowd and the accomplishment. But more than the touchdown he scored, Van Buren may have been remembered most for recovering a Dion Johnson fumble during the ferocious comeback in the second half of the game. “If I didn’t jump on that ball, we definitely would have lost,” he said. “You know, it was part of doing what you need to do. Even now, you watch guys, even the pros, they will go after a fumble and just lay on the ball, but you are supposed roll over on the ball. It’s all about technique and doing what you are supposed to do. The way we were, after Luke scored, we were like, ‘OK, we have to keep doing what we are doing.’ I don’t think any of us ever relaxed, but we kept our cool as well. Though he was thrilled to be part of the championship team, Van Buren knew his year still lay ahead, his senior season. So, it was of particular note to Van Buren when head coach Bill Lewis, following the Peach Bowl victory, announced he was going to be leaving to Georgia Tech. “Lewis leaving kind of surprised us because he told us he wasn’t going to go anywhere,” he said. “But, I was glad when Logan took over because Bill Lewis used to beat us up. We practiced so hard that during the season, the defensive and offensive guys didn’t like each other. We won the Peach Bowl, but we didn’t like each other. We were glad to get to games because we were so beat up during the week it was a relief. He used to have Bloody Tuesday and that was exactly what it was. During the season, you’re all swollen and black and blue from the hitting… you were literally beat up for a year. Since Logan was an internally promoted coach, continuity remained within the program and Van Buren focused on his senior without the worries most players have during a change in staff. Though he was happy with Logan at the helm, he admits it wasn’t easy. “In practice, Logan would throw out a play,” he described. “For each play, he’d call a letter and that was the route you had to run. Whoever was next, you just broke it off. He would make a play up and you knew who had to be where no matter what was called. When you had a blitz, you knew where everyone had to be. We were glad when teams blitzed us because the ball was going to go wherever the blitz came from. I would never have blitzed us back then. Van Buren’s senior season brought more change. In came the highly talented back Junior Smith out of Fayetteville and Van Buren saw his role change. He was excited because he knew that he would be the go-to guy whether it be running the ball or receiving. However, his senior season would be over too soon, as it was learned that Van Buren had a neck injury that he had been playing with for years. Once discovered, the risk was too much and Van Buren hung up the cleats. “I’m going to tell you something now that will probably surprise you,” he said. “I had the neck injury when I came to ECU and didn’t know it. My sophomore year in high school, I broke my neck in two places playing football. They tried to tell me it was Spina Bifida, but it wasn’t. I had a specialist (while at ECU) look at it and he said, ‘That’s a crack.’ I actually remember when it happened. We were playing a (high school) game up in North Carolina and I was playing free safety and I went up to hit their running back and one of my linebackers hit me from the side. I remember that my whole body went numb. My whole sophomore year I wore a neck brace. Even now, I sleep better on one side than the other. I never went in and got it checked. I didn’t miss a practice. I just wore the neck brace. Van Buren made the right decision, but it wasn’t easy… even with his health on the line. With the time available now that he was not playing, Van Buren let nothing go to waste while finishing up his degree. He began pursuing another love of his, photography. He became the photo editor at The East Carolinian and did some photojournalism. He graduated and though Logan lobbied him to stay and coach, he couldn’t do it. And his efforts paid off when a stunning model walked into his studio. They married and are partners in Van Buren Photography. At Nucor Steel, Van Buren is a pulpit operator. He and his wife continue to grow the photography business and he has also started a modeling agency (Douvan Modeling). He is a busy man. “I am four days on, four days off, and during the off days, I am working my photography business and that is to the point now where people are getting a chance to see my work,” he said. “I’ve been perfecting my craft for a long time and I don’t think there is anyone down here that can touch what I do. I brag on it because the work I do is beautiful. I study it and my wife and I went down to Mississippi for a week and went and studied with the millionaires and I looked at their work and I am like, ‘We are in the right place now.’ Things happen for a reason and I know its coming. And he still gets a football fix… from his son. It seems a shame that Van Buren isn’t in coaching. It's obvious from talking to him that he has the mind for it and he knows it. Though he admits that he has lost touch with his former teammates, his love for ECU is no more diminished. When you talk a few minutes with Cedric Van Buren, you quickly realize a few things. First, he is a pure football fan. Second, he is a detail-oriented, true student of the game of football. While many other players will talk about emotions or big games, Van Buren prefers to talk about breaking down film, technique, and strategy. The man should truly be coaching. That said, the former Pirates running back who hails from and still lives in Charleston, SC, has kept a keen interest in ECU and, particularly, was candid about the latest firing (of coach John Thompson) and subsequent hiring of former University of South Carolina assistant Skip Holtz at East Carolina. “I tried to follow the team this year, but the way they were losing games, it was difficult,” he said. “To be honest, I saw them last year play against Miami. They played good for the first half and then the second half they stunk it up. My mother follows sports too and she is heavy into football. She is 62 years old, but she loves football. She knows the game. I told her last year as soon as I saw that game, “East Carolina’s not going to keep that coach (Thompson) long…They’re not going to be able to keep him long. Putting on a coach’s cap, Van Buren said he would like to offer the current players a little advice, care of his former coach at Middleton High School in Charleston. Van Buren believes the current roster needs to look in the mirror and take stock of themselves individually and be prepared to compete each season regardless of whether Thompson was still there or not. Holtz is going to demand that each player earn his respective position and each player should demand it of themselves. On the new coach, Van Buren is taking a wait-and-see attitude though he admits he is skeptical that Holtz will have a whole lot of success based on what he saw at USC. “Well…to be honest, I hope Skip doesn’t run the offense he ran at South Carolina,” Van Buren said. “If he runs that, we will be looking for another coach in two or three years. They ran a whole lot draws…a whole lot of single back stuff…a lot of that West coast offense stuff the people have caught up to. While Van Buren is hopeful…his gut tells him ECU fans could be in for some disappointment.